Hollywood, CA, United States (4E) – The Beyhive is once again abuzz as new reports have surfaced saying that her new album will be released this April 1 and that she will be collaborating with Adele, Kanye West, and Mariah Carey. 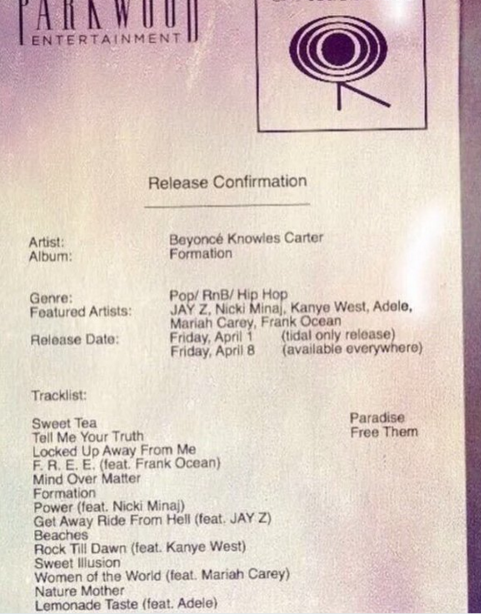 A tweet circulated on the internet showing Parkwood Entertainmen , the management company of Beyonce, and the words “Release Confirmation.” Accordingly, Beyonce’s sixth album is entitled “Formation” and aside from Adele, West, and Carey, she also collaborated with her husband Jay Z, Nicki Minaj , and Frank Ocean. The album will be released this April 1 only on Tidal but it will be available everywhere by April 8. The track list includes songs entitled “Tell Me Your Truth,” “Sweet Tea,” “Looked Up Away From Me,” “Mind Over Matter,” “Beaches,” “Sweet Illusion,” “Nature Mother,” “Paradise,” and “Free Them.” These songs are the singles she has worked on her own while the ones with the collaborations are entitled “F.R.E.E.” (featuring Ocean), “Power” (featuring Minaj ), “Get Away Ride From Hell” (featuring Jay Z), “Rock Till Dawn” (featuring West), “Women of the World” (featuring Carey), and “Lemonade Taste” (featuring Adele). However, it could be remembered that the same kind of release confirmation circulated before and it was proven to be fake. Also, fans are saying that it could be too good to be true as there are too many information and that it will be dropped this April 1, which is April Fool’s Day. Despite the speculations it could not be true, Elle magazine is also currently counting down from 25. They are posting one Beyonce photo every hour on their Instagram page so it is either they are counting down for the release or the singer will be gracing the cover of the magazine. The reports about the new Beyonce album are yet to be confirmed by the mother of one or any of her representatives.